Brioche is technically a French pastry, but in simple term it is a highly enriched bread with high egg and butter content. 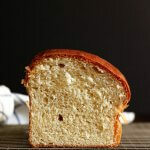 The high amount of fat makes this Brioche Loaf light, with finer crumbs, and oh so very rich. It also has a deep golden brown flaky crust that’s usually played up using egg wash. 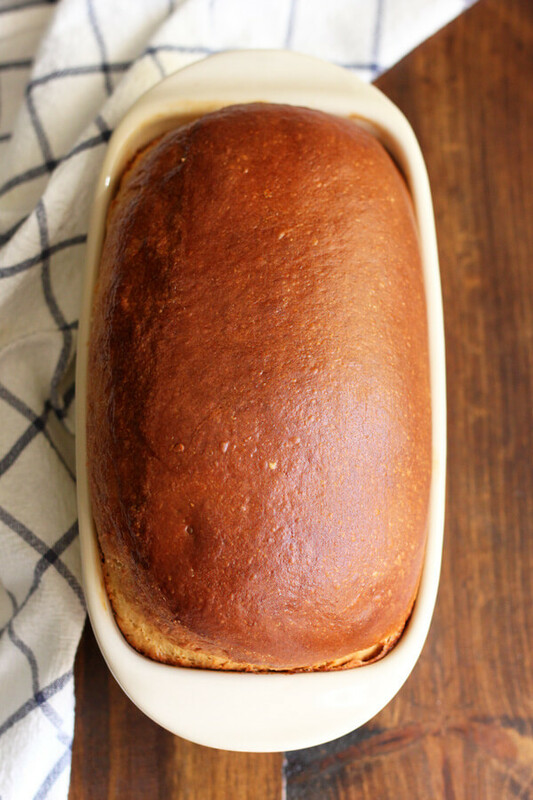 This Brioche Loaf will make a delicious replacement for store-bought sandwich bread. The egg and butter give it a rich taste and a lot of flavor that will sure make your lunch sandwich look impressive and a whole lot more enjoyable. 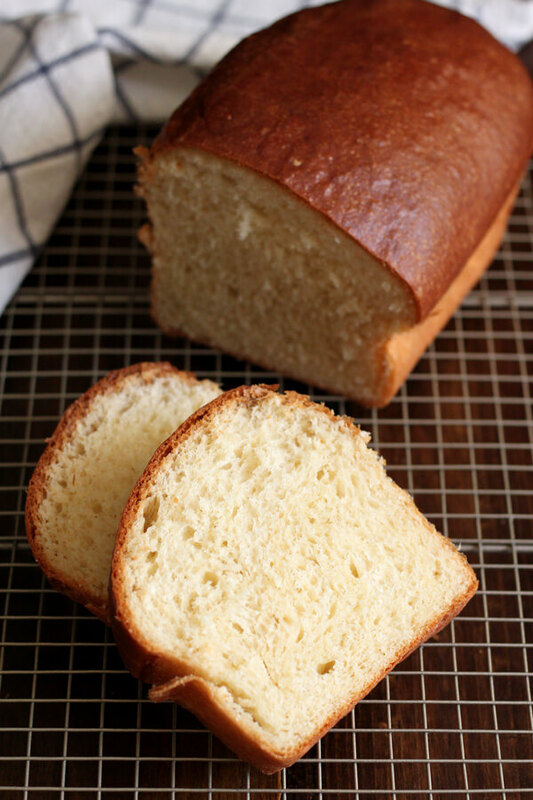 You will have to make two loaves of this to expect any left over, but thick slices of this bread will make great French toast for weekend breakfast. Or take it another step further and use it to make melt-in-your-mouth bread pudding for dessert. This is one recipe I would recommend making with a stand mixer due to the longer kneading time. Or you can also successfully make this using a hand mixer with the dough hook attachment. Always bloom active dry yeast to make sure it is working. If the yeast mixture doesn’t puff up when bloom, it is best to redo this step until you get an activated yeast mixture. Otherwise, your dough will not rise. I find that large eggs can vary in size. They range from 1-7/8 to 2-1/4 ounces, which can make the dough too dry or too wet. So rather than trying to get an exact measurement of the eggs, I vary the milk portion to compensate for this. However, I also find that this recipe is very forgiving. Too dry you can add a little more liquid, too wet you can add a little more flour while kneading. Either way, the end product always comes out beautifully. I have to admit I’m a total carb addict, so I love a good slice of bread any time of the day. I’ll eat it with cream cheese and jam for breakfast, and with peanut butter and jelly for an afternoon snack. Yup, you heard me, cream cheese! 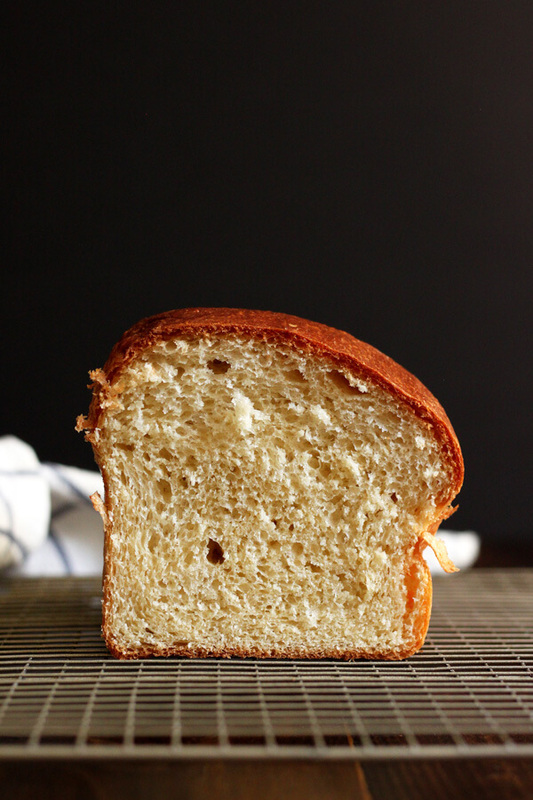 Make this and you will never go back to store-bought sandwich bread again. Cut the butter into 1/2” cubes and let soften at room temperature. Leave eggs and milk out on the counter to come to room temperature as well. Mix together 2 tablespoons of milk and 1 teaspoon of sugar and sprinkle the active dry yeast on top. Let it bloom for about 10 minutes. In the bowl of your stand mixer, lightly beat the eggs and add the bloomed yeast mixture along with the flour mixture to it. Use the dough hook to knead on low speed (speed 2) for 15 minutes. Check occasionally to see how your dough is looking, if it is too dry, sprinkle in the rest of the milk. By the end of 15 minutes, it should pull away from the side of the bowl. Leave the mixer on speed 2 and add the soften butter, a few pieces at a time, allowing it to combine with the dough before adding more. This will take about 10 minutes. Then let the mixer knead for another 10 minutes. Dump the dough out on a lightly floured counter and shape into a ball. Place dough into an oil glass bowl and let rise at room temperature for 1 hour. At this point, you can let the dough ferment in the fridge overnight, or let it double in size (approximately 1 more hour) and move on to the next step. 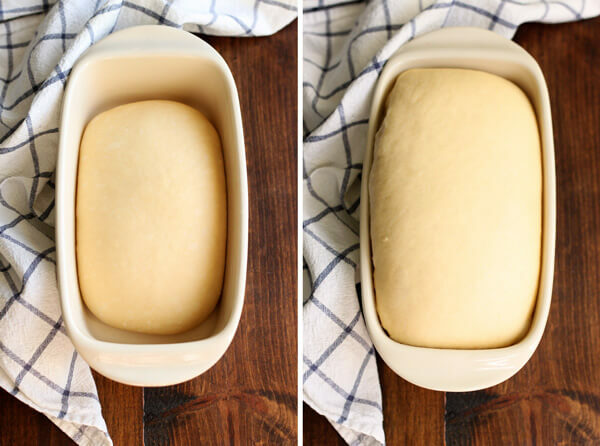 Let to dough come to room temperature if you just remove it from the fridge. Brush a 5x9 loaf pan with melted butter or coat with nonstick spray. You could also line the pan with parchment paper leaving some excess hanging out on both sides. Dump the dough out onto the lightly floured counter, knead and shape into an elongated shape to fit your pan. Let rise until more than double in size and supple looking, about 2 hours. Apply egg wash once more and bake for 35 minutes until golden brown, and an inserted wooden skewer comes out clean. At any point during baking, if the top of the bread is getting too brown, you can cover it with a piece of foil to avoid over browning or burning. Remove from oven and let cool to the touch on a wire rack before attempting to remove it from the pan. If you had lined the pan with parchment paper, simply lift it out. Otherwise use a butter knife to loosen the sides and flip it out of the pan. This recipe is adapted from multiple sources: Thomas Keller’s Bouchon Bakery and Zoe Nathan’s Huckleberry. My loaf turned out perfect! Thank you for the recipe. It’s going to become a staple in our home! I’m so happy to hear, thank you so much for the feedback Jeannine! Measured carefully and followed the directions exactly. It never got beyond a liquid mess. At the “should pull away from the sides if the bowl” part if the recipes, it was soup. Because yeast bread is not my thing, I read and read the recipe for two days…for yeast soup. Such a waste of time and ingredients. I’m sorry this recipe didn’t work out for you. I’ve used this many times and never experienced it being “soupy”. Without being in the kitchen with you, I’m not sure what went wrong but sounds like for some reason you had too much liquid. I would like to help you troubleshoot the next time around if you decide to try it again, you can always email me with specific questions if you wish. Hi if I have to use wild yeast instead of instant what would be the measurements. Thanks. Hi Bency, I typically use active dry yeast and not instant yeast. You can use same amount of instant yeast as active dry yeast. But I have never seen “wild yeast” in a package. Let me know what you mean exactly as I understand that wild yeast is just in the air and you’ll need to allow the dough time to ferment in this case. 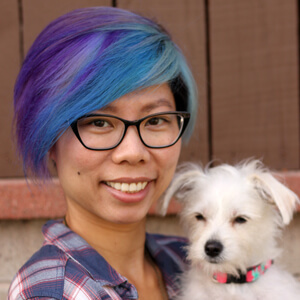 Hi Stefanie, thank you so much for your feed back! I know bread baking isn’t a half an hour task 😉 but it shouldn’t have taken two days either, not for this one anyways. From what you’re telling me, I think you might have gotten a bad batch of yeast. If it isn’t bubbly and puffy after you proof it for 10-15 minutes, it is best to try it again because it means your yeast is probably dead. And if you try it again and still nothing, best to return that one and get a new jar 🙂 The fact that your bread still rise after 7 hours could mean that you had wild yeast in the air that aided that process, kinda like making sourdough starter. We eat bread so much at my house, I still buy bread, but it’s fun to make my own when I have the time 🙂 I hope you will try this again! Trang, I made this bread using your recipe. It was absolutely delicious. I will keep a copy of this recipe to make again and again. Thank you for sharing! Blessings to you! Terry, thank you so much for your feedback! 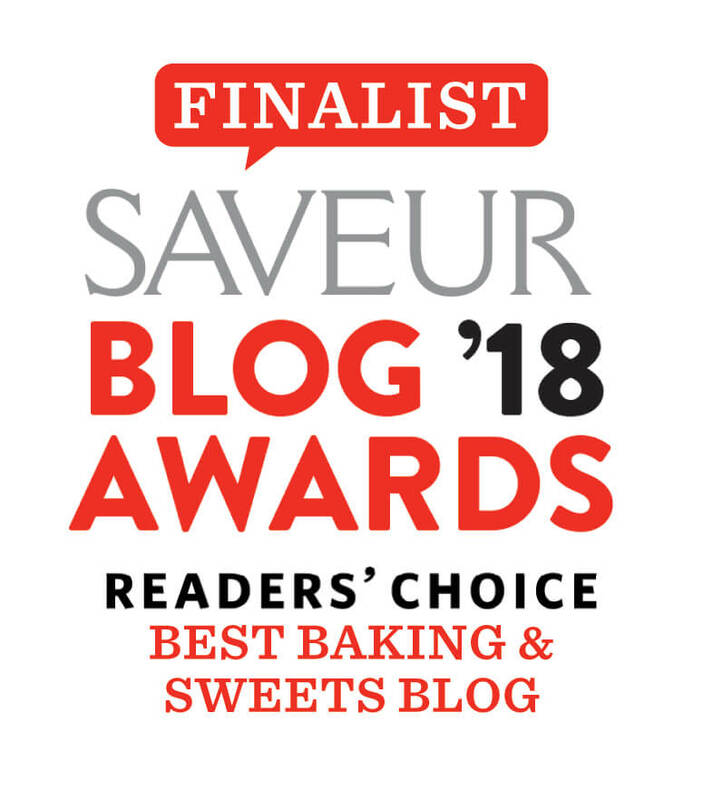 It makes me very happy to know that someone enjoys the recipes I post here :). Hope you and your family are having a wonderful holiday season! With accordance to your earlier recipe tips, can you provide the weight of each ingredient please? For salt and yeast, you can continue to use the teaspoon measurement since they are small enough amount. I am such a sucker for homemade bread! This looks fantastic. Brioche is my favorite bread! I totally need to try your recipe and I’m sure your tips and tricks will come super handy. It looks so good!! Looks perfect for making french toast! I love making homemade bread and brioche is one of my favorites. I love enriched dough so this is definitely my kind of recipe. I love making bread – I find it therapeutic. 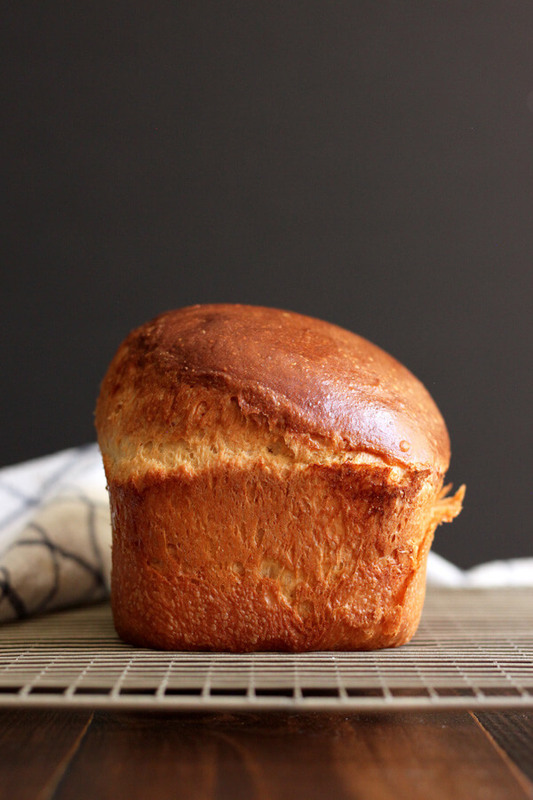 But I’ve never made brioche so I’m definitely adding this one to my list. I love bread but have never baked my own. I totally need to try this! Your pictures make the brioche look really yummy. I want to eat that right now, coming out of the oven!